Discussion in 'Regional' started by IMPUL, Feb 26, 2014. These are the requirements for a quote from federated insurance. Attached please find the automobile quotation form, which outlines the details required to provide you with a Personal Automobile quotation. 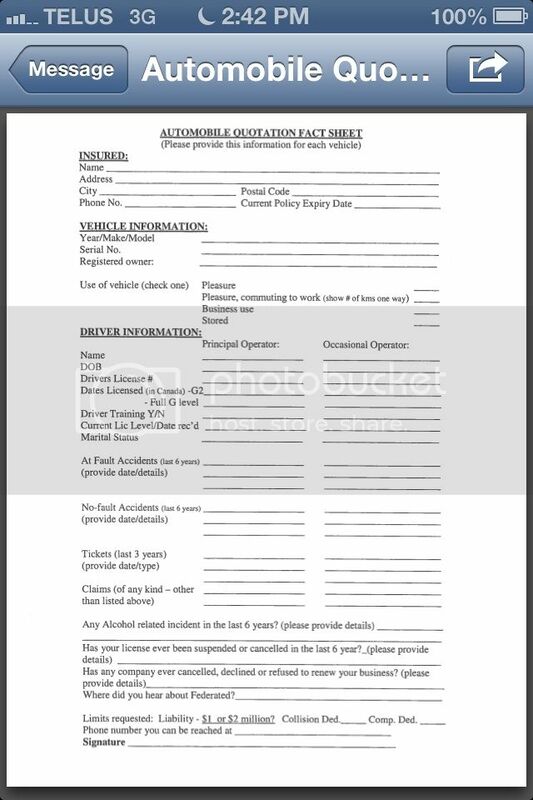 If you can fully complete this form (one form for each vehicle), and return to my office, I will be happy to provide you with a quotation. Right Hand drive vehicles will take longer to obtain pricing. These vehicles are not currently in our system, therefore we must obtain all of the above documentation, which has to be submitted to IBC to have the vehicle added to our system . We can not price this until this has been completed. No appraisal. The safety certificate could be the form 1 I guess. hmmm. interesting. You've been killing it lately IMPUL! Debbie, are estimates available without the above mentioned documents? I need to know if it's even possible for me to insure a RHD car before I consider bringing one over. @IMPUL only quoted an email by a rep named Debbie, he is not the first hand source of the information. It will certainly be possible to insure the car you bring over, not necessarily at a reasonable rate provided by a non-high risk insurer. We have mandated insurance, so legally you MUST be provided some form of insurance if you have a license and vehicle. The rate is a whole different story. That is just a copy of an email bettween debbie and I. Im not debbie.